Fluorescent dextrans have a wide variety of applications. The high water solubility, biocompatibility and range of functionalities make fluorescent dextrans ideal for many applications. They come in an array of molecular weights, fluorescent dyes, dye ratios and additional functional groups. Fluorescent dextrans from Fina Biosolutions use our well-characterized amino dextrans as their base. 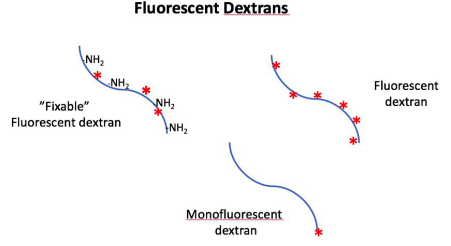 This section also lists unique monofluorescent dextrans, which use our proprietary end-labeling chemistry to tag the polymer end with a single fluorescent group. 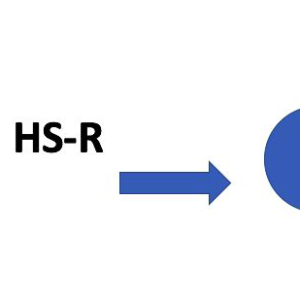 Fluorescent amino dextrans, also known as “fixable”, contain amino groups which can be reacted with crosslinking reagents such as glutaraldehyde. Fluorescent dextrans do not have any residual free amine groups. 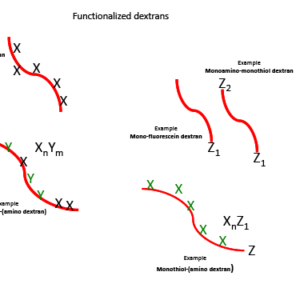 Dextrans with other fluorescent dyes available as custom products. 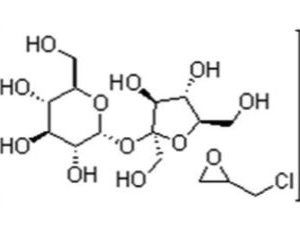 Please contact us for custom dextran reagents.